Mackenzie Mitchell says the “dynamism of scientific study, as well as the complete integration of problem-solving,” have been the greatest influences over her decision to study science. Since enrolling at Wesleyan, Mitchell has furthered her interests by participating in research with Associate Professor of Molecular Biology and Biochemistry Amy MacQueen’s research group. She currently investigates the roles of budding yeast’s central element building blocks, Ecm11and Gmc2 via yeast 2-hybrid (Y2H) assays. Her basic science research has been augmented by research at Columbia Presbyterian in which different biomaterials for heart valves were explored. 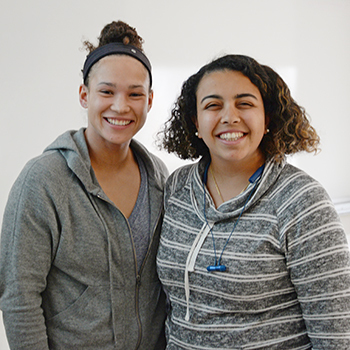 In addition to being a team captain for the women’s soccer team, Mitchell is a member of the Natural Sciences and Mathematics Coalition, which works to tackle the barriers minority students face in NSM. She also is a member of the Student-Athletes of Color Leadership Council, volunteers as a mentor to a second grader at the local elementary school, and works with a program for students 18–22 with disabilities who are bridging the gap between high school and college. As an aspiring doctor, Mitchell hopes to use her undergraduate experiences to expand the exposure of an ethnically diverse workforce in medicine. Lina Marzouk was born and raised in Cairo, Egypt, and went to high school in Los Angeles. She first became interested in science at her father’s farm in Egypt. “I used to go visit every week and loved being able to plant my own garden, learn about how the crops are doing, and explore the workings of nature on my own,” she said. At Wesleyan, Marzouk works with Professor of Molecular Biology and Biochemistry Scott Holmes on studying epigenetic interactions and chromatin structure, specifically focusing on histone interactions in maintaining chromatin stability. She’s now in the process of writing a senior honors thesis about this research. Marzouk also mentors underclassmen in the sciences through the Wesleyan Mathematics and Science Scholars Program cohort and works as a teaching assistant for the Introduction to Biology lab. She’s also worked as the STEM-focused Peer Career Advisor at the Gordon Career Center. After graduating this May, Marzouk hopes to pursue a dual Medical Doctor and Master of Public Health (MD/MPH) program and work with underserved communities in the U.S. and internationally.